Inviting all active and aspiring Mompreneurs! 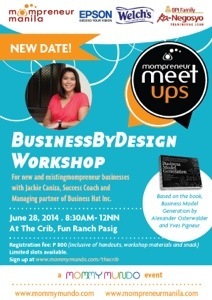 The next Mompreneur MeetUp is going to be this Saturday, June 28, from 9 am to 12 noon at The Crib, Fun Ranch in Pasig. With no less than Success Coach, Jackie Caniza as the workshop speaker/facilitator, this Business By Design workshop aims to provide interested mompreneurs the necessary know hows when it comes to designing one’s own business according to target goals and needs. Based on the book, Business Model Generation by Alexander Osterwalder and Yves Pigneur, this is designed specifically to teach momprenuers, business owners, and teams, how to view their business through a one-page framework that captures all the critical components of a business model. Workshop fee is 800 but free for all past attendees and Mommy Mundo Passport Holders.